Dean from Australia: Gonna Fly Now. 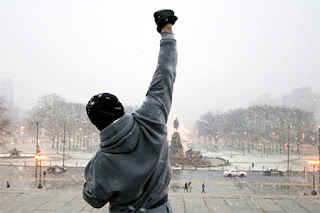 You know when, during the Rocky movies, Rocky Balboa begins that ubiquitous training montage of his to composer Bill Conti's rousing theme "Gonna Fly Now"? Right from the very first refrains of those brassy trumpets that herald it's beginning, you just know that Rocky is going to prevail. That, from all the effort, the self doubt, the trials and tribulations that have peppered his journey up until that point - you just know things are going to be alright - okay good! On Thursday afternoon I had to run a couple of errands and I took my son with me for the drive. Do you know, I can't even remember, what the errand was that I was supposed to be running, my mind has been so preoccupied this week. Anyway, as we're driving along, my son Xavier begs me to put on his favorite song of the moment - which just happens to be Bill Conti's "Gonna Fly Now". After a little protestation from myself - I was happy just to listen to the cricket - I relented and I thumbed my smart-phone's screen until I brought up the Media Player. In a few seconds that familiar and rousing trumpet refrain burst through the car and Xavier was cheering in his seat, punching the air with his fists as we got into the song for the umpteenth time. And so, fast forwards to Friday morning - to when I first wake up and, as I have religiously these past few days, I launch into the ritual of checking my phone (email) hoping that, that one message that I have been waiting nervously for since last week had arrived. I am thrilled to officially announce today that I have signed with iReadiWrite Publishing of Vancouver, Canada and that my first novel "The Hambledown Dream" will be published as an eBook - to be sold in the iReadiWrite store and it's partner stores. iReadiWrite Publishing is a small but growing digital press that has been a fervent supporter of new and emerging writers looking to get their works published in the growing market place of electronic books. With a focus on literary fiction across a number of genre's, iReadiWrite Publishing has a growing catalogue of exceptional works in it's store and they are all reasonably priced to make them affordable and attractive. You can thank the emergence of the iPhone and more recently Amazon's Kindle for driving an increasing interest in the eBook. In fact it has been reported that eBook sales are fast over taking sales of traditional books, such are their appeal to the modern reading public. Words cannot describe how thrilled I am to be achieving what I consider to be one of the most significant dreams of my life. Since I was in my senior year at high school I have held onto the dream of becoming a published author. I have had many attempts at crafting that one great story, that novel that I always believed was in me. And now here I am. An official release date for the book has not yet been pinned down but I am hopeful that the book will go live on the store within the next month or so. There is still a lot of work to do prior to it becoming available but rest assured that I will keep the updates flowing here. I would like to invite you to spread the word about my book. I believe in it, I poured my heart into it and I would like as many people around the world as possible to read it and hopefully enjoy a tender and emotional love story that is quite a lot different to what you might expect.